The Volkswagen Bug or Beetle is like a couch. It that can serve an array of different purposes such as building forts, substituting your bed or even allowing you to get intimate with your partner. The Bug was whatever you wanted it to be, a late night cruiser, delivery van, or a desert conquering baja prepped machine. A very popular use for it was the famous beach buggy which became as much a synonym for beaches as irritating seagulls and deformed sand castles. The Beach Buggy's modifications included a convertible roof (some had a constructed fabric roof, but most went through life without one), different wheel arches to accommodate bigger tires and an even more basic interior since it was going to be filthy from seashore'ing. Since the engines and transmissions from these little Bugs were so simple to keep running, the same ones have been running for years and years with mostly slight renovations in the paint and seats. No other new car seemed to be as adequate for the task as the Beetle, so it has kept on ever since. Until now. The Mexicans in Jalisco have turned the most inexpensive offering from Volkswagen, the Gol, into a sand bashing, bikini appreciating, tropical juice drinking, coconut smelling, towel transporting, shark teeth collar wearing seashore warrior. 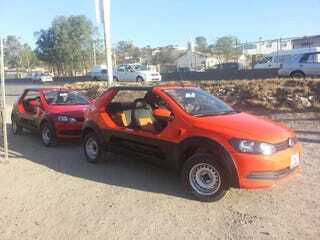 This is the best modern interpretation of the beach buggy to date as it is professionally made to accommodate the same 5 passengers as the stock Hatchback, the same dead reliable power-train of the Gol, an available roof, painted it in 5 groovy colors not available from VW and they even went to the trouble of fitting a redesigned trunk to accommodate all tan lotions the passengers desire. I searched endlessly for an official webpage, but the most information I could find was that it was built in the city of San Pedrito in the state of Jalisco and they already are selling them to major rental agencies in the coasts. Price for the whole package is $210,000 Pesos or about $14K US Dollars so it will be more expensive than the original. But, if you are ever in the coast of Merida or the beaches around the south make sure to look for these and enjoy them because thats what their father would like.